You know, horror sequels get a bad reputation for getting silly or boring over time. Now, there are some that do give this rep some credibility (looking at you, Jason Takes Manhattan). But among horror sequels, there are some truly great gems that have as much punch, or sometimes even more punch, than the originals. 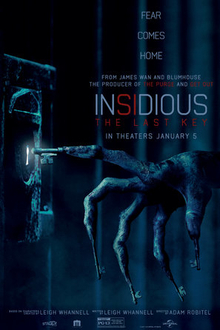 And Insidious: The Last Key is one of those sequels, not just for being scary and creepy, but also for keeping things interesting with a character-driven narrative. In this entry in the Insidious series, Elise Rainier (played by unacknowledged Hollywood treasure Lin Shaye) is called back to her childhood home to defeat the evil spirits that live there and which haunted her childhood. As she and her two stalwart companions Specs and Tucker delve deep into the hauntings in the house, they will not only uncover horrors from the Further, but from this world as well, and from Elise’s own dark memories. This was a seriously solid horror movie. The best part of it, of course, is Lin Shaye’s performance as Elise Rainier, along with the character’s own arc in this movie. The arc itself is kind of similar to Elise’s arc in the last film–that she’s dealing with trauma and has to overcome it to save a life–but here, the scars are so much deeper, and the raw emotion you feel from Shaye as Elise opens them up makes it seem all so new. You feel her pain, you feel her wanting to make amends, and when you see her triumphs, you share in them. As always, the atmosphere in these movies is creepy, the right balance between tension and jump scares. The creepiest part, in my opinion, is the antagonist, The Man With the Keys, or Key Face as he’s listed on Wikipedia. This is such a freaky looking demon, and unlike the Man Who Can’t Breathe from the last film, who got scary once you could see him in the light, The Man with the Keys is freaky no matter when you see him. In the light, out of the light, he’s so scary. I think if you put him up next to Bill Skarsgard’s Pennywise and had a contest on just visual terror, it’d be a very close call. I also like, in addition to the many keys we see in the movie, there is just so many key-shaped imagery in the movie. Pumps, signs, etc. They’re all key-shaped, kind of tying into the theme of the movie of opening up old wounds and opening up the past. Was there anything I didn’t like? A few things. I honestly thought the climax wasn’t as epic as it could’ve been. Not only that, but a few things we saw in the trailers didn’t show up in the film, which is always annoying. And finally, Specs and Tucker, our supposed comic relief, just weren’t that funny. But all in all, Insidious: The Last Key is well worth plunking down cash for a ticket. On a scale of 1 to 5, I give it a 4.4. Check it out, and open yourself up to some terrifying storytelling. That’s all for now, Followers of Fear. We’re likely going to have a bunch more reviews this month, so I hope you’re ready for recommendations and opinions. And if the trailers I saw in the theater are any indication, I’m going to have a lot to say in 2018. *I’m assuming that we’re going to get a sequel, given that already the film has made back its budget and then a bit two days after coming out.